30-employee regional trucking company co-owner has passionate heart for her hometown, and is Connect Business Magazine Business Person of the Year 2007. Roxie Mell-Brandts of Garden City, Connect Business Magazine Business Person of the Year 2007, preserves hers by restoring a Minnesota town. Technically, Garden City never has been a city. It is really only a collection of perhaps fifty modest homes that just happen to be near each other in Garden City Township, about fifteen miles south of Mankato adjacent to the Blue Earth County Fairgrounds. Garden City’s singular stretch of driving cement meanders past two country churches, a recently abandoned school, a coffee shop and a stop sign. It has a tiny post office. The lazy Watonwan River wraps around the leafy town as a loose-fitting Christmas scarf. It was on this rural Americana canvas of a Norman Rockwell painting that Mell-Brandts was born and raised. And she has spent most of her life trying to restore her precious childhood memories. She is renovating the abandoned school, doggedly preserving the memory of her town’s most famous citizen, and has turned an old hardware store into a coffee shop, created an annual Christmas pageant and a regional car show, offered outdoor summer movies to the community, and helped refurbish an historic church building. She served two terms on the Lake Crystal-Wellcome Memorial school board, perhaps in part to help preserve her childhood school. Yes, she co-owns a trucking company, but that seems almost an aside. She is president of Jensen Transport, a 30-employee hauler of propane, anhydrous, and soybean oil having headquarters in South Bend Township near Mankato and with other facilities in the Twin Cities and Benson. 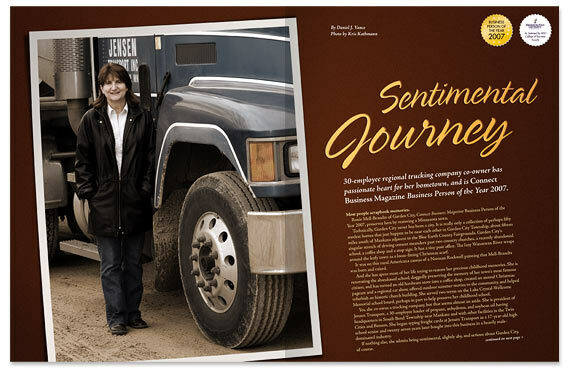 She began typing freight cards at Jensen Transport as a 17-year-old high school senior and twenty-seven years later bought into this business in a heavily male-dominated industry. If nothing else, she admits being sentimental, slightly shy, and serious about Garden City, of course. CONNECT: When did you start with Jensen Transport? MELL-BRANDTS: I started working for Del Goebel in 1970 at age 17, during my senior year in high school. Del had five trucks leased to Quickie Transport and hauling petroleum products. At first, he needed me to type freight cards. After graduating from high school I went to night school at what is now Minnesota State. I’d work from 10 or 11 in the morning to six at night, and on Saturdays, and take three night classes a semester. It took me five years to graduate with a Business Administration degree in accounting. I ended up never leaving—I’ve always been in the office. I do the dispatching, licensing, reports, and deal with drivers and customers. In essence, I held down the fort while Del was out getting business. In 1997, Del retired, and his son Randy and I bought the business. Today, Randy takes care of the truck shop and maintenance—and we have never argued. We each do our part and it works. Business has gone on as usual. It’s quite remarkable in today’s world that someone would stay at the same business so many years. I’m 54. I started here at 17, so that makes 37 years. Of those 37 years, in 27 of them you were an employee and not an owner. Were there times you thought of leaving and doing something else? Sure, every job has ups and downs, but bottom line I liked what I was doing. The business seems like home and Del and Betty Goebel are family. We aren’t a large company, so we know everyone we are working alongside. This is what I do. My children have grown up with mom dispatching trucks, and all three of my daughters have worked with me. What does it feel like being a woman in a male-dominated industry? It’s much more common now, and it doesn’t bother me. However, in the 1970s, when dispatching and doing all the office work, I took some interesting calls. One man said, “Give me one of the guys that knows something.” Another comment: “Oh yeah, yours is the company with the woman dispatcher.” Even the dispatchers back then were men. And I was determined to do it better than any of them. (Laughter.) That fueled my personal drive to succeed. God didn’t give me a brain not to use it. What further differentiates your company from others? I don’t know if we are so different. Our drivers like the fact we are local. We also laugh a lot here, and try accommodating each other’s needs. We try to be flexible and work together to make it work. Isn’t a dispatcher a little like an air traffic controller? Oh yes. That can be a stressful job. It is stressful and at times I have been in tears. There are so many variables to consider to making it all fall together—sometimes I’m just plain lucky. And sometimes I feel like quitting and wonder why I’m doing this. On days like that, invariably, there will be a person turning it all around and making my day better by saying something like, “If you ever quit, then I’m quitting too.” There are people that make you feel good no matter what you are doing. How large is your company? We operate 25 company trucks and the rest are owner operators. The units are based in Mankato, the Twin Cities and Benson. We have a large base of trailers because of the seasonal products we haul, such as propane, anhydrous, black oil, bean oil, and petroleum. One of our larger propane customers is Lakes Gas. We haul propane from pipelines in Vernon Center and Eagle Lake to them. When winter comes, of course the propane business heats up. In November we finish up the anhydrous and the corn-drying season. For anhydrous, we haul to Crystal Valley Co-op, Harvest Land, Watonwan Farm Service, and smaller co-ops such as in Fairfax and Gibbon. And we haul soybean oil for CHS. I also haul out of the Minnesota Soybean plant in Brewster. In the summer we haul road oil to contractors, a seasonal product that keeps drivers busy. We have about 30 employees, including company drivers, mechanics, and office employees. We have secure truck yards in the Twin Cities and Benson, and a truck yard and headquarters in Mankato. Tell me what you know about Sir Henry Wellcome. He grew up in a very poor family in the 1860s in Garden City. Due to an uncle owning the drug store, Sir Henry became interested in being a pharmaceutical entrepreneur. When seventeen, he left Garden City for an education at Mayo in Rochester and from there he worked with Silas Burroughs to form Burroughs Wellcome & Co., which became a huge international pharmaceutical company. He became a British citizen in 1910, and King George V knighted him in 1932. He was first to direct market free drug samples to doctors and later was a world-famous archaeologist. The company initially made its mark as the first company compressing medicines into pills. It also was an early leader in manufacturing insulin and vitamins. Does it seem odd to you that Sir Henry Wellcome achieved more world fame than anyone has from southern Minnesota, and yet he is virtually unknown here? I would say it isn’t too odd. Everyone is from somewhere and local history often is not taught in schools. Sir Henry Wellcome happened to grow up in Garden City and felt he wanted to leave something to the community. The school district here is called Lake Crystal—Wellcome Memorial. Sir Henry left funds in his will to construct the gym and library in Garden City. But people forget those things. He died in 1936, and the funds he left were frozen in London banks due to World War II. After the war, Ernest Hansen of Garden City helped pursue and ultimately free the funds. Sir Henry wanted the funds used to construct public buildings. In the 1950s, the Wellcome Memorial Trust in Garden City (WMT) decided its public buildings would be a gym and a library, and it attached those buildings directly to the adjoining public school building. Sir Henry also set aside money for maintenance. As for the library, the school district transferred all its books to Lake Crystal when it closed the public school in Garden City. The old library building is being used as a community or meeting room. Today, the WMT in Garden City has assets of more than $600,000. After initially leaving Garden City, did Sir Henry ever return to visit? His parents remained, and he returned numerous times. He had close friends here. In 1922 he donated land to erect a new school building for the area, and that building is still there, used until recently by the school district. He also purchased special curtains for the stage and also new science lab equipment. And, as the story goes, right before he died in 1936 he asked a “secret” friend to buy the land where the gym and library are now, which in his will he would leave along with the funds. There must be people alive today who remember seeing him. Lyle Lafavor, a long-time Garden City resident, lives in Mankato. In the 1930s, Sir Henry spoke at his graduation. But the house Sir Henry grew up in is long gone. You visited the $25 billion Wellcome Trust in England. Why? In 1997, which was my first of what would become four trips, I took my mother-in-law and three girls. I went in part because I like London. Bill James and Bob Fleming of the WMT board called ahead to help us get in. The Wellcome Trust in England promptly called back asking how many of us were coming, and telling us that board chair Sir Roger Gibbs would host us for lunch. And he and they did—the entire board of an organization that today has $25 billion in assets. It was an enlightening experience. They were very formal. I walked in with my three girls, ages 9, 11, and 13. There were all these men on the board seated at a round table, and they seated my girls among them. Sir Roger grabbed my mother-in-law and me by the hand and said, “You two will be sitting with me.” They made us all feel important. The Wellcome Trust headquarters has a massive library containing Sir Henry’s manuscripts and his personal library. Since our first trip, the organization has constructed a new building occupying a city block near the old one. Sir Roger often has been credited with turning around the Wellcome Trust and making it successful once again. On a second trip I went with Bill James, former Blue Earth County Recorder, to meet with a new board chair. We made them more aware of our group’s direction in Minnesota, and were trying to learn if they were interested in doing more in the States. We asked how they perceived Sir Henry’s will. In short, they answered that WMT in Garden City was a separate entity from their Trust and they didn’t have anything to add to what we were doing. Was it your hope they could perhaps become a ‘white knight’ to bring closure to the LCWM bond referendum battles, which had split your school district for years? The district had six failed bond referendums before finally passing one. I had been corresponding with the Wellcome Trust in England over the years. In 1996 people there said the organization would be celebrating Henry Wellcome’s 150th birthday in 1998—and they were looking for ways to celebrate. I submitted a proposal to turn the WMT building in Garden City into a science and learning center for children. In my mind, that would have been the perfect celebration of his life, but they rejected my proposal. How many people in the world were asking for money from that organization? But if you don’t try, you don’t get anywhere. They said the project I proposed was outside the parameters of what they were considering. I’d had an architectural plan and a lot of hope. I later became a WMT board member, about three years ago. You were on the Lake Crystal-Wellcome Memorial school board for seven years. Most businesspeople wouldn’t touch a public job like that with a ten-foot pole because it could hurt their business. It didn’t affect my business. It’s not as if I own a retail store where people can purchase groceries or gas. I have a regional service. We haul to the Twin Cities and Iowa, for instance. How well did you deal with people disagreeing with your work on the school board? I take things too personal sometimes. The only reason I ran for the school board was because I couldn’t say that somebody else should be doing something—and then not do it myself. You have to be responsible and try doing something. Running certainly wasn’t for the fun of it or the money. I felt something needed to be done. I don’t feel I was successful, but at least I tried. As for school buildings, I always thought of them the way I do a car. A car gets you back and forth to work whether it’s new or old. It doesn’t matter if you’re in an old or new school, the education isn’t about the building, but from what goes on inside. Sure a new building is nice. But I don’t see the value many people place on new things. Perhaps that’s a reflection of the way I was raised—to value a dollar. There was one failed bond referendum that was yours, meaning it was one you personally authored. What was your hope with it? The cost of that particular referendum to taxpayers was relatively low. In my mind, the issue was always cost and to keep a school in the different communities. It was a real battle. Even if we had kept schools in Vernon Center and Garden City, at some point due to costs we might not have been able to keep the buildings operating. But at least for a while it would have given it a chance to work. If it had passed, we would have had four buildings rather than the current two. The bond issue I proposed and the district voted on addressed code issues I considered necessary in the elementary schools in Vernon Center and Lake Crystal. There would have been an addition to the middle school in Garden City, and an upgrade at the high school in Lake Crystal. That is what I felt people wanted. It was a $6 million referendum. I thought it was an answer, but my proposal never received a second chance. You eventually purchased the closed school building in Garden City? The school district offered the Vernon Center and Garden City buildings to the governing entities, which in Garden City’s case was the township board. My idea was to convert the Garden City building into apartments. The township board turned it over to a partner, Dan Wingert and me. We have had many disappointments the past three years. We tried with Minnesota Housing and USDA, the latter having a rural economic development plan. After three years of jumping through hoops our loan was approved. But by then renovation costs had increased 30 percent, making the project no longer able to cash flow. So now we are working with North Star Family Services. This is a go, meaning we have the financing. It will be a home for women who are looking for help to end their drug and alcohol dependency. They can live there with their children while going through classes and a treatment program. And not everyone in the area is enamored with the idea? People always approach the unknown, and change, cautiously. But do you know what problems your next-door neighbor is dealing with? Probably not. In this case everyone knows that the residents in this building will be dealing with real-life issues and trying to rebuild their lives. I wish people would ask themselves, What if that were me with the problem? Where did Christ preach and to whom did He preach? He was helping these very kinds of people. In my mind, if we aren’t willing to extend ourselves to help people, then we aren’t being very good Christians. I believe this home will prove to be an asset to the community. You didn’t grow up wealthy? Do you think your humble upbringing shaped your view of the world? I would imagine there were people that looked down on you as a person when you were growing up? My parents were hard workers. We didn’t grow up with any frills, but we had everything we needed. Sometimes I did have that feeling that others looked down on me—but maybe it was just a feeling. I would have never let anyone know because then they would have succeeded in making me feel less of a person. What did they do for work? My dad always worked two jobs. He drove a milk truck for Marigold Dairy, and worked for the City of Mankato in vehicle maintenance. My mother worked in housekeeping at Hillcrest Health Care Center. Their examples instilled in me the values of hard work and of appreciating the little things in life. You don’t have to spend money to have fun. You have started a small housing development in Vernon Center? John Rollings started it, doing all the legal platting. In April 2006 I told him that I had a couple houses to move and didn’t have a place to move them. I asked if he was interested in selling the lots he owned near the empty school building. Initially I’d heard he wouldn’t be interested in selling, but it fell together. I brought three homes from Lewisville all at once and a fourth came from one of our farm sites. The remaining three lots were given back to the city for a park. Any particularly difficult challenges doing it? Calvin Baarts of Vernon Center Lumber helped me make some decisions. The development still isn’t done, but it’s getting close. We pulled the entire process off in only a few months, including getting a water line in. The homes are selling from $100,000-140,000. They all have new air conditioners, furnaces, carpeting, and basements. You were also responsible for starting an annual Christmas pageant in Garden City. Why do it? While our communities were having such turmoil over the failed bond referendums, I was sitting in church one morning thinking about whether then was the time to start a pageant. Daren Flinck, pastor of the Methodist Church in Vernon Center, was first to join me. We started working on it just before Thanksgiving. The pageant was rough that first year and extremely cold. But we did it—and have had ten since. About 300-400 people come. But in 2006 I decided to take a year off. There will likely be a Christmas pageant in 2007. Having more than 300 people each year is a great number, but in a way I’ve been disappointed. I’ve always hoped that churches would use it as a tool to educate their children, but for the most part they haven’t. We’ve sent flyers to nearly 200 churches every year and advertised the free event in newspapers and on radio. Why have an annual Sir Henry Car Show and have outdoor drive-in movies for the community? You grew up going to church in Garden City? I grew up going to Garden City Baptist, and though I don’t attend that church anymore my heart feels warm now that it’s been refurbished. The church began in 1868, and the building is the oldest of its kind in Minnesota. The bell is ringing at the church again after perhaps 40 years of silence. We had a successful fundraiser at the coffee shop to help refurbishing. It was fun for people to come back—people were talking and laughing at the fundraiser about things they had done. Hearing the ringing of that bell is one of my fondest memories from growing up, and something my mother wanted to hear again. I tend to be sentimental. One thing I remember about growing up in Garden City was the smell of Crane’s Hardware. After buying the building, over time I started restoring it. One day, my oldest daughter Hannah told me that I had wrecked the smell of it because of putting in new sheetrock. Do you credit part of your success to any one person? My parents worked hard. I grew up working, and was taught to be responsible. I hope I’ve instilled those same traits in my children. I feel each person is responsible for themselves and where they are in life. I also feel that God has a plan for each of us. For some reason He has me in trucking. I don’t know why, but I figure He has a plan. God is using me as an instrument. I’m not sure what His whole plan is, but someday I’ll know. I believe there is a reason for everything. Connect Business Magazine advertised its Business Person of the Year 2007 contest in the July and September issues. And we attracted a sterling pool of nominees. In October, a team of Minnesota State University business professors chose Roxie Mell-Brandts as Connect Business Magazine Business Person of the Year 2007 based on the following criteria: business results, leadership abilities, community involvement, and character. Tom Fallenstein and Todd Snell were runners-up. This was the second year running that nominees living outside Mankato won top honor. CONNECT: You purchased the old Crane’s Hardware building in Garden City and the Post Office building. Why? MELL-BRANDTS: I didn’t do it for the money. The hardware store was the last business in town to close, and I didn’t want anyone to buy it and then tear it down. It had memories for me. Garvin Crane bought it in the 1920s and Obie and Sue took it over, operating it until the late 1980s. They had an auction for the contents and later put the building up for sale. At the auction, I bought their old safe. You know how heavy those safes are—you can’t pick them up. Garvin had taped the combination to the front of the safe because he didn’t want anyone wrecking it in a break-in. He figured if they had broken-in that far, they were going to get into the safe anyway. I still have the tape on the safe, and it’s in the coffee shop I own, Formerly Crane’s. I also bought the building. I waited a couple years before restoring the building because I didn’t have a direction in mind. Then I decided to open it as a coffee shop. It developed and the idea grew over time. When Ray’s Standard Oil station in Garden City went out of business, I bought his counter. I’m too much of a sentimentalist and hate seeing those things gone. Formerly Crane’s is also a museum and I have gathered local history there. We cover expenses and volunteers run it. It’s billed as a coffee shop/museum, but really it’s more a community center. Family: Husband Paul Brandts, and children Chad, Hannah, Lacie, Carlie, and Trevor. © 2007 Connect Business Magazine. All Rights Reserved.